Hot dog! Meat, veggie and potatoes combine in one skillet for a time- and dish-saving success. Scoop ice cream into cupcake liners and keep frozen for fix-it-fast desserts. Keep help-yourself toppings on hand, and you’re set! Squirt salad dressing right into the bag of salad greens; shake to coat. Divide among plates, and throw away the bag! The kidney beans in this dinner are packed with benefits, as are all legumes. You get protein, folic acid and fiber in these nutritious gems! Make a quick, kid-pleasing meal with ingredients you have on hand! 1. Stir together Potatoes, Sauce Mix, hot water and milk in 10-inch skillet; stir in frozen peas until separated. 2. Heat to boiling; reduce heat. Cover and simmer 15 to 20 minutes, stirring occasionally, until potatoes are tender. 3. Stir in hot dogs; cover and heat 3 to 4 minutes or just until hot dogs are hot. Sprinkle cheese over mixture. Cover; let stand about 5 minutes or until cheese is melted. All the great taste of classic sloppy joes in an easy one-skillet pot pie. No one will miss the buns! 1. Heat oven to 400ºF. Cook beef and onion in ovenproof 10-inch skillet over medium heat, stirring occasionally, until beef is brown; drain. Stir in sloppy joe sauce. Sprinkle with cheese. 2. Stir remaining ingredients until blended. Pour over beef mixture. Easy never tasted this good! But don't be fooled by the ease of this dish. With its creative presentation, you'll be proud to serve this dish to guests. 1. Heat oven to 350°. Mix pasta sauce and water in medium bowl. Spread about one-third of the pasta sauce mixture in ungreased rectangular baking dish, 13x9x2 inches. 2. Sprinkle garlic salt on chicken. Insert chicken into uncooked manicotti shells, stuffing from each end of shell to fill if necessary. Place shells on pasta sauce in baking dish. Pour remaining pasta sauce evenly over shells, covering completely. 3. Cover with aluminum foil and bake about 1 hour or until shells are tender. Sprinkle with cheese. Bake uncovered about 5 minutes or until cheese is melted. Sprinkle with basil. Saddle up your family for this easy pasta and bean skillet. It has a great chili taste that's worth hitting the trail for. 1. Heat all ingredients except cheese to boiling in 10-inch nonstick skillet; reduce heat. A flavorful and simple dessert! The moist, chewy crust--made with Bisquick® mix, oats and brown sugar--surrounds your favorite raspberry spreadable fruit, jam or preserves. 1. Heat oven to 400°F. Grease square pan, 9x9x2 inches. Mix Bisquick mix, oats and brown sugar in large bowl. Cut in butter, using fork or pastry blender, until mixture is crumbly. 2. Press half of the crumbly mixture in pan. 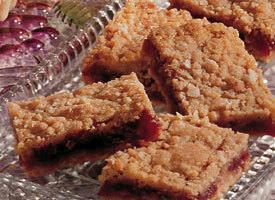 Spread fruit over crumbly mixture to within 1/4 inch of edges. Top with remaining crumbly mixture; press gently into fruit. 3. Bake 25 to 30 minutes or until light brown; cool. For 24 bars, cut into 6 rows by 4 rows. Dill weed adds a fresh new taste to ordinary tartar sauce and seasons your baked fish wonderfully. • Stir dill weed into tartar sauce (about 1/4 teaspoon dill weed to 1/2 cup tartar sauce); reserve and refrigerate some for serving.• Place fish in greased pan. Brush remaining tartar sauce over fish fillets (1 to 2 tablespoons tartar sauce for 1 pound fillets). Bake uncovered in 375°F oven until fish flakes easily with fork (about 10 minutes per inch of fish thickness). Serve with reserved tartar sauce. Chili Bean Burritos Let the microwave speed your way to these spicy chili bean and cheese burritos. Your taste buds will say, "Olé!" • For each burrito, spoon chili beans (with sauce) down center of tortilla; sprinkle with cheese. Fold 1 side of tortilla over cheese; roll up. Place seam side down in microwavable dish. Spoon additional chili beans in sauce over tortillas; sprinkle with additional cheese. • Cover with plastic wrap and microwave on High about 3 minutes (for four burritos) or until cheese is melted and burritos are hot. Serve with salsa and sour cream. Spice cake and apple pie filling combine to make one delicious cake! 1. Heat oven to 350ºF. Grease (or lightly spray with cooking spray) bottom only of 13x9-inch rectangular pan. 2. Beat cake mix (dry), pie filling and eggs in large bowl on low speed 2 minutes. Spread half of the batter in pan. Mix sugar and cinnamon; sprinkle half of the mixture over batter in pan. Spread remaining batter in pan; sprinkle with remaining sugar-cinnamon mixture.3. Bake 32 to 36 minutes or until toothpick inserted in center comes out clean; cool. Serve with whipped topping. 1. Thaw and drain asparagus. Drain mushrooms. Cut chicken breasts into 1-inch pieces. 2. Melt butter in 10-inch skillet over high heat. Cook chicken, mushrooms and onion in butter 3 to 5 min, stirring occasionally, until chicken turns white. 3. Stir in Sauce Mix, water, milk and mustard. Heat to boiling, stirring occasionally. Stir in uncooked Pasta. Reduce heat; cover and simmer about 10 min, stirring occasionally, until pasta is tender. 4. Stir in asparagus. Cover and cook 2 min, stirring occasionally; remove from heat. Uncover and let stand about 5 min or until sauce is as thick as you’d like (sauce will thicken as it stands). Stir before serving.